You may be thinking that Wisconsin is the last place you’d want to spend your glorious week free of classes for Spring Break-but you’ve never been more wrong! Open your eyes to the possibility that is Devil’s Lake State Park, located near Baraboo, Wisconsin. Though March in Wisconsin has its fair share of questionable weather, it’s a guarantee that Devil’s Lake will make the stay worthwhile. With dozens of trails, countless natural rock formations and fishing opportunities, this state park is the ideal spring getaway. Need another reason to stick around in Wisconsin and check out Devil’s Lake? Even as a college student, it won’t break your bank! Though purchase of a parking pass for your vehicle is required, there is no additional fee to enter and enjoy the park-unless you are planning to camp out. And if you’re interested in fishing in the lake, just be sure to have fishing licenses on hand to abide by Wisconsin law! 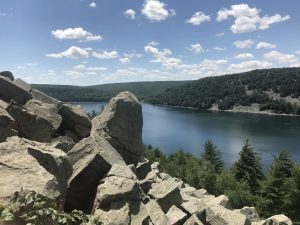 The state park’s location to Madison is also an advantage: with only an hour drive each way, Devil’s Lake is perfect for a day trip with friends to explore and hike the many bluffs that overlook the lake itself. One additional thing to keep in mind is that the park’s hours are shorter in the spring season than they would normally be during the summer. Though the park hours are extended on Friday nights as well as all day Saturday and Sunday, weekday hours during are from 8:30 a.m. to 4 p.m.
Be sure to check out Devil’s Lake State Park for more information and trip ideas to ensure that your spring break is spent the best way possible.